As with overall equity concerns, gender equality is important for both intrinsic and instrumental reasons. It has a bearing on family harmony and on wellbeing in many dimensions. It involves policy-making with respect to society as a whole, i.a. education, labour and financial markets, economic and political empowerment, institutions, and economic growth. The prospects for achieving the Millennium Development Goals are both directly and indirectly improved by enhancing gender equity. Thus, there are close links between the reduction of both gender inequalities and multidimensional poverty. The empirical evidence suggests that developing countries with less gender inequality tend to have lower poverty rates. Gender inequality represents an untapped source for stimulating economic growth and promoting social development. This is particularly true in the developing world, where women are often systematically deprived from having equal access to social services as well as to physical and social capital. Hence, reduced gender inequality promises significant returns; empowering women by improving their living conditions and enabling them to actively participate in the social and economic life of a country may well be the key for long-term sustainable development. 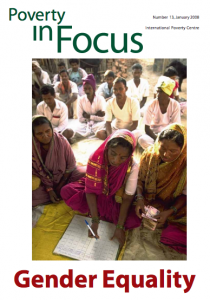 This issue of Poverty in Focus highlights the importance of improving gender equity for pro-poor growth and improved wellbeing of poor families, with references to recent research literature and sharing of important and policy-relevant results.